Root believes Obama is “Boiling the Frog” by overwhelming the country with deficit, debt, entitlements, onerous regulations, and tax hikes. His real goal to destroy the middle class and create just two classes of Americans. Wayne discusses why should Texas be the gold standard for saving America and how Detroit is the model for Obama’s America. He also talks about Y-Pods and how can you use them to protect your assets, save yourself from the fall-out of the spiraling national debt, and improve your financial position. Finally, Wayne finishes his animated interview with tips for Americans to fight back against Obama and why owning a gun is essential to survival. Wayne Allyn Root is not only the best sports handicapper in the business but also an American politician, entrepreneur, television and radio personality, author and political commentator. He is a best-selling author of 7 books, a regular guest on FOX News, and a television celebrity who has served as Creator, Executive Producer and Host of shows such as “King of Vegas” on Spike TV and Wayne Allyn Root’s WinningEDGE” on Fox Sports and Superstation WGN. Rootis Founder and Chairman of Winning Edge International Inc. In the 2000s, he hosted Wayne> Allyn Root’s Winning Edge, a television show which promoted Root’s sports handicapping operation. Root was the creator, executive producer and co-host (along with HBO’s Max Kellerman) of King of Vegas on Spike TV. Find out more about Wayne Allyn Root at www.rootforamerica.com. Read more about Winning Edge at www.winningedge.com. Announcer: What’s great about the shows you’ll find on JasonHartman.com is that if you want to learn how to finance your next big real estate deal, there’s a show for that. If you want to learn more about food storage and the best way to keep those onions from smelling up everything else, there’s a show for that. If you honestly want to know more about business ethics, there’s a show for that. And if you just want to get away from it all and need to know something about world travel, there’s even a show for that. Yep, there’s a show for just about anything, only from JasonHartman.com. Or type in “Jason Hartman” the iTunes store. Jason Hartman: It’s my pleasure to welcome Wayne Alan Root to the show, he’s the founder of Winning Edge, and a former Libertarian Vice Presidential Nominee. He’s the author of the Ultimate Obama Survival Guide, How to Survive, Thrive and Prosper During Obamageddon. Wayne how are you? Wayne Root: Hey Jason, glad to be on. Thank you for having me. Jason Hartman: Yeah, well welcome to the show. Where are you located today? Wayne Root: Well I live in Las Vegas, Nevada. I happen to be here today on my book tour, but you know I go back and forth to New York and Washington, DC to do interviews. And in between I do most of them by phone, most of the radio interviews by phone here in my beautiful home in Las Vegas, Nevada. Jason Hartman: Fantastic. Tell us a little bit about your background if you would and how you came to write the book. I think it’s a fitting book for today’s times, unfortunately. Wayne Root: Well the backgrounds that matters, the two that apply the most is that I’m a capitalist evangelist. And what that means is that I love capitalism and I love…I’m a serial entrepreneur who loves running businesses, starting businesses, funding businesses, raising money for businesses, selling my products. I do it all with gusto and passion and enthusiasm. And I see Barack Obama just destroying our economy and demoralizing every businessman in this country and putting down and demonizing capitalism and I can’t take it anymore. And that’s why I wrote this book, The Ultimate Obama Survival Guide. But the other reason is – the other one’s even more important – I happen to be Barack Obama’s college classmate. Jason Hartman: In Columbia, okay. Wayne Root: Columbia University Class of ’83. Jason Hartman: Fantastic. So he really did go to Columbia. At least we know this – we have a witness. Wayne Root: Here’s the funny thing. No, we don’t have a witness. He says he graduated Class of ’83, Political Science major pre-law. I was Class of ’83, Columbia University Class of ’83, Political Science and Pre-Law. So, you would assume that the President of the United States is telling the truth. You would assume that Columbia University is backing him up and saying he graduated our school is telling the truth. But I can’t say I ever saw him because I didn’t. And I thought I knew every person in the whole world at the Columbia Political Science Department. Certainly, I thought I’d seen every person who was a political science major in my classes at one time or another, never saw him, never heard of him, never met him. Jason Hartman: Very interesting. Well, I can tell you I at least know he went to high school because my ex-girlfriend’s older sister was his classmate in high school in Hawaii. At least we know that. Wayne Root: He exists. We know he exists, he’s a real person. He’s just a bit of a Manchurian candidate. He’s got a strange, mysterious background. He knows he’s got a problem about Columbia. Fox News called 400 of my fellow classmates in 2008 and never found one who knew Barack Obama at Columbia. So when he interviews, he said “Oh, that was going through my monk days. I was like a monk in the library and never came out to speak to anybody.” Well, what’s interesting about that is he sealed all his records in college. Now, if you seal your records, you might assume someone has terrible grades, right? So, if he studied so hard and never came out of the library and he’s such a bright guy as every liberal tries to create the narrative, then why has he sealed his records and why did he have bad grades? Jason Hartman: That is a wonderful question to which I bet we will never know the answer, Wayne. Wayne Root: We’ll never know the answer. But this much I do know. Assuming he went there and he probably just never went to class…Because there were a lot of people like that – believe it or not, at Ivy League schools, you can get away with never attending class or rarely attending class and just get a gentleman’s C. They won’t flunk anybody. Once you get in, they assume you’re the best and the brightest in America and no matter what you do they will not flunk you. You get a gentleman’s C. So he probably got a gentleman’s C in every class without ever going to any class. He spent too much smoking pot and going to communist party meetings. And so my feeling is the guy was there. He must have known many of the same people that I know. He must have spoken about the same things that we all spoke of in that time, in that age, in that moment in history. And guess who he talked about all the time at Columbia University? Wayne Root: Cloward and Piven. You know who Cloward and Piven are? Wayne Root: It is two Columbia husband-wife professors who came up with a theory that we needed to turn America into a socialist nation – this is their theory – and you could never do it any other way except from within. You’d have to get someone elected who the American public felt was a moderate. He acted moderate even though he’s truly a communist or a Marxist. And he’d have to cut his hair or his afro and put on a nice suit and he’d have to act like a moderate and say he’s a uniter, not a divider, and then slowly but surely, like the way you boil a frog, so low the heat is that you just put it on simmer so the frog doesn’t even know he’s dying and before he knows it he’s dead. And the way to do that is overwhelm the system with debt and spending and entitlements. And, ladies and gentlemen, again, I never saw him at Columbia, but assuming he went there, he learned well because that’s the system he’s using to destroy this economy as sure as I’m sitting here. Jason Hartman: Well, let me ask you. I can understand what you’re saying as coming off as a moderate and really not being one. Certainly, that story has been played out throughout history many times, politicians hiding their real agendas and such. But overwhelming the country with deficits and debt – entitlements, that makes sense because then you buy votes, you buy a constituency – but how directly does the deficit/debt issue move us more toward socialism? Wayne Root: Well, here’s what Cloward and Piven said. You have to read their work. What they said, this husband and wife team, Richard Cloward and Francis Piven was that the only way to turn America into a socialist nation is to first destroy capitalism. So you have to take the economy down. You have to collapse the economy. You have to create such crisis that people cry out in pain “Government, please save me! Government, help me!” And even the richest people have to scream that. And you put all the business owners out of business – Jason, and from that point on they scream “Help me, help me” – they want a government check, too. And the next thing you know, the system collapses and it’s government in charge of everything and the people don’t mind. They’re asking for it. Jason Hartman: Really that’s not in this case a false flag, but that’s the false flag mentality – create a crisis and the government comes to the rescue on the white horse, etcetera. Wayne Root: When there’s a crisis, people react in panic. And they make bad decision. I think it’s important to note that, too. Because I think they’ve done that again and again. I mean, I think Obama created a terrible economy in the last 4 years and then he ran for reelection and said “I’m the guy to fix it” and they voted for him. Bad decision, terrible decision made in panic. I think Obama created a fiscal cliff crisis. He’s the one that screamed about it after reelection and then the American public demanded we do something about it and Obama did something about it and he said “I solved it” and guess what the solution was. He added $4 trillion in debt to a debt crisis. And that’s how he claimed he solved a fiscal cliff caused by debt. Folks, under direction, under panic, we’re allowing someone to ruin The United States of America. Jason Hartman: Well, that’s the mentality of trying to put out a fire with gasoline, piling more debt on a debt problem. It’s pretty interesting. One thing that concerns me very much, Wayne, and I’ve been seeing this happen for a couple of decades now. And the thing that has always made America so wonderfully stable and peaceful is that it has this large middle class. But the middle class has been under attack. The middle class is disappearing. What is behind Obama’s seeming motivation to just weed out the middle class? I mean, of course he’s got the crony capitalists, Solyndra and so forth, that are benefiting from a certain kind of government largess at Tesla, Solyndra, whatever – any electric car or solar maker or windmill maker, they’re in. And then you’ve got the entitlement constituencies at the low end, the poor or the lower middle class. He’s buying their votes. But what is behind the motivation to destroy the middle class? It seems like the middle class is sort of the last man standing that is barely standing. 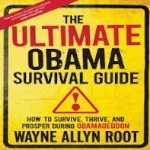 Wayne Root: Listen, I wrote this book, The Ultimate Obama Survival Guide to prove that Obama’s goal is to destroy the middle class. He’s got two friends in this world. First of all, the main reason he was reelected is the poor, the masses of the poor. Same reason Fidel Castro stayed in power, same reason Hugo Chavez stayed in power. The poor are desperate and despondent and dependent on government to save them. And he’s their hero who redistributes the wealth from the rich and the middle class to the poor. So they love him for it and that’s your foundation that gets you reelected. Then you need money. And the money comes from the super-rich, the heads of the biggest corporations in America, guys like Jeffrey Immelt of GE. Plus, you not only need their money – you need their media cooperation. Jeffrey Immelt and GE owned CNBC and MSNBC. So you need them to be on your side and to spew your propaganda. And you need the super-rich like Warren Buffet on your side. You notice Warren Buffet is always fighting on behalf of Obama and higher taxes. Why does he do that? Because Obama bribes people like him and Jeffrey Immelt. GE has gotten the benefit of bailouts, stimulus, green energy contracts. You name it. Even their subsidiary MSNBC has gotten gigantic advertising money from the Obama campaign. So, they’ve all been bribed. And that’s what he wants to create, a society with very rich people who need him to stay very rich and get even richer and very poor people who were dependent on him and he doesn’t want anybody in between – a 2 class society and you and I are gonna get stuck in the poor. That’s all he wants because that’s what Karl Marx wanted. That was the whole point of communism is to get rid of the middle class because they’re bourgeoisie. They’re people like my father, Jason. My dad was a minimum wage butcher who, from the day I was born, said “Son, you’re going to be rich. We are republicans and you’re going to model yourself after rich people and you’re going to rise above me and you’re going to be a rich guy with a business.” And that’s exactly what happened. And so he doesn’t want that. They hate the bourgeoisie because the bourgeoisie is the middle class people who love the rich, idolize the rich and want their children to become the rich so they don’t want to overtax the rich. Well, Obama needs to get rid of people like that. Jason Hartman: We have another name for that. It’s called a Banana Republic. Wayne Root: That’s the name of one of the chapters in my book, by the way. Jason Hartman: Yeah, it really is another book I’d recommend and I do want to get him on the show but it’s War on the Middle Class which is a fantastic book as well, and it just talks about how the middle class is just under attack from every angle. Wayne Root: And, Jason, let me just make one other observation. Middle class, to most people, equals $50 to $100 thousand dollars a year. That’s middle class. When you get above $100, I would call it upper middle class. Certainly, you can’t jump from 100 to 150 thousand a year and call everybody above that Warren Buffet. Warren Buffet makes $100 million a year, $200 million a year, $300 million a year in just interest, whereas someone who makes $250 to $500 thousand a year is usually a small business owner. That’s who 90% of all the supposed rich that Obama criticizes and demonizes are small business owners like me. I’ve always made $250 to $500 thousand a year. I’m a small business owner. And that’s the upper middle class and it seems like that’s the number one target of Obama. He wants to wipe us off the face of the earth. He can live with the people who make $50,000 a year because they do need government. They need to supplement with food stamps or free education and free health care. But the guys who make $500,000 a year and own two restaurants or two real estate offices or a couple of dry cleaners or a couple of gas stations, those people are fiercely independent, like me. I’ve never asked for a single check from government in my life. I’ve never had a government contract in my life. I don’t like government, I want nothing to do with government. We can’t stand high taxes and we write all the checks to republican candidates. So he needs to wipe us out in order to get rid of the opposition. Without our money, there wouldn’t be any money for republican candidates. It isn’t like Mitt Romneys of the world live on billion dollar checks. The reality is they live on upper middle class small business owners writing thousand dollar checks to republican candidates. So, if Obama can eliminate us, that’s the real target of Obama – he gets rid of his whole opposition if he eliminates us. Jason Hartman: Well, let’s talk a little bit about a tale of two states, not a tale of two cities. But I often talk on my show about Texas and that possibly being the first state that will have a real bonafide secession movement if things don’t change. And then I also talk about the disaster called Michigan. And it’s a perfect example of why small government works and big government doesn’t work. And you look at Detroit and it’s just the model city’s program. There is nothing right about Detroit except recently Michigan became a right to work state. I was shocked when that happened a couple of months ago. Maybe there’s some hope. I don’t know. Wayne Root: Yeah. Listen, the two central chapters in my book, outside of the chapters about how the individual can succeed in this age of Obama and I think the individual can make money even if the country goes under, and so most of my book is dedicated to showing you actually how to make money and prosper in the age of Obama and it is possible to do. But other than that, the two central chapters about the country and the economy are about Detroit and of course Texas. And the Detroit chapter basically says, listen, Detroit’s been under democratic rule since 1961. That’s the day I was born. I was born July 20th, 1961. And so republicans have never been in charge since 60 years ago. And look at the results. It’s an empty town. Everybody’s left it. It’s got nothing but abandoned lots and abandoned buildings. 2/3 of the street lamps are out of service. 50% of the adults are illiterate. It leads the nation in violent crime, leads the nation in murders. There’s nothing good you can say about Detroit, yet it’s been run by Obama’s democratic policies for 50 years. What’s the excuse of democrats? There’s been no republican opposition. They claim they’re so big on education. Why 50% of the adults are functionally illiterate? Why are I believe 56% of all the children live in poverty in Detroit? 35% of all the families get food stamps. It’s the most embarrassing statistics you’ve ever heard in your life and it’s run 100% by democratic policies that mirror Barack Obama for 50 years. So, America’s going to become Detroit if you let Obama take over. Detroit is Baghdad or Kabul in the middle of America. It’s a third world hellhole and it’s run by Obama’s policies. Then you look at Texas, as you said, Jason, and Texas is run as a purely capitalist free market republican conservative state, and they can’t stand lawyers, they limit lawsuits, they can’t stand unions and they lower the taxes and they’ve got far lower welfare benefits than states like California and New York and the result is they lead the nation is job creation. Not only that, but they lead the other 49 states combined for the last 10 years in job creation. What more do you need to know about the way to run a country versus the way not to run a country? Jason Hartman: It’s a great point and a point well taken for sure. G. Edward Griffin has been on my show a couple of times. You probably know his work, The Creature From Jekyll Island. Wayne Root: I know him very well. We speak together at many events. Jason Hartman: Yeah, he’s a great guy and he really said it well when you talk about this seeming war between democrats, republicans, left and right. I really think nowadays it’s more like two of the same. I’m wondering how valid this whole war really is. G. Edward Griffin likens it to a wrestling match that you watch on TV that’s pretty much for entertainment, maybe as a distraction. Wayne Root: I was at an event with him in October and I was saying how much I wanted Romney to win the election. And he said exactly that. There’s no difference between them. Romney’s no different than Obama. And I said you gotta be kidding me. Listen, Romney may be a moderate wishy-washy northeast republican, but he’s a capitalist who loves businessmen – he is one! And he’s an expert at turning around countries. Jason Hartman: In the last election, what do we need more than a turnaround specialist? Wayne Root: That’s it, exactly. That was my argument for months heading into the elections. A lot of libertarians were mad at me because I endorsed Romney on Fox News and I said, listen, this isn’t about who’s more libertarian. This is about who has the perfect resume to save the American economy. And nobody could be better at than Mitt Romney who knows how to make money, knows how to turn around failing businesses, knows how to cut budgets, knows how to hire people and also, when you have to, knows how to fire people. He was the perfect guy. So, it’s not only the case of like G. Edward would say “Who’s more libertarian?” – well, neither one of them. Okay, but you need a capitalist businessman to run the economy and Romney would have been much better than a guy who is a Marxist ideolog named Barack Obama. So, I agree the republican party disappoints us often. I disagree that there’s no difference between the two parties because there’s still a big difference. Jason Hartman: Alright, fair enough. You look at the shady side of things, the talk of the new world order and who’s really pulling the strings. I mean, it’s shocking to anybody who’s just clearly thinking about it no matter what side of the political aisle you’re on, that a guy like Obama, with basically no resume, could actually become the most powerful person in the world who came largely out of nowhere. I mean, a few years before he was elected nobody knew who he was. Jason Hartman: That’s what makes the argument of the new world order, though, that the Bilderberg group runs the media. It’s just corporatized…All the news is way too centralized now. Wayne Root: That was true, and it’s definitely partially true, but if that was 100% true then the Bilderbergs would have rather had Romney than Obama. Obama wouldn’t have been reelected. I think they would have much rather had at least a pro-business guy who wants to give away the store to the banks and Wall Street than a communist-Marxist ideolog who actually secretly – not even secretly – it’s pretty obvious he hates banks and Wall Street – but he cringes and he sits on his hands and he bites his tongue and he goes along with giving them money just because he knows that he needs their contributions and he needs their buy-ins to his program, so he buys them. But he doesn’t like them. At least Romney likes them. Jason Hartman: It probably doesn’t matter too much because either way they’re going to get their agenda put forward. But Obama’s going to be more of a gun control advocate and disarm America and allow them to control the population more and so forth. But we don’t have to go down that road too much. I just wanted to kind of bring it up. But anything more on the Michigan versus Texas discussion? Wayne Root: No. I think it’s pretty simple stuff. And I think I summed it up pretty well. I mean, that shows you the road. Which road should America take? Well, if you want to become Cuba, then take the Obama road and the Detroit road. And if you want to become something better, a great capitalist country like we had after Reagan, then you’ve got to take the Texas route. But as we finish this interview, I’d love to get in a couple points. I interviewed 18 of the richest guys in America, what they have to say, how you turn around your own personal economy. Jason Hartman: Definitely. And I want to ask you about YPODS, too. But yeah, tell us about your personal economy and what you do given the person environment. Wayne Root: Well, that is YPODS. YPODS was my little name for Your Personal Obama Defense Shield. It’s a combination of two things. I came up with the 18 point plan and I’m a small businessman and a son of a butcher, a blue collar SOB as I say, and a guy with common sense, but not a $100 million man. So I decided that liberals would probably mock me and say who cares what Wayne Root thinks? He’s just a little small businessman. So I decided to go and interview 18 of the richest men in America and ask them what their game plan is for the next 10 years to try and survive Obama and beyond. And they gave me their game plans and I wrote them in the book. And you get to see how a small businessman like me thinks and you get to see how the richest guys in America thinks and you get to see how the richest guys in America think, how you prosper on Obama. And, by the way, most of what I said matches with what the rich man said. We were on the exact same page on so many issues. The number one thing we agreed on was gold. I’ve always been the biggest believer in gold and all these rich guys all want to load up on gold. And when it went down two weeks ago, they all said buy with both hands, buy with both fists. Go in there and get gold at 25% discount. It’s the greatest buying opportunity of all time and sure enough it’s gone up I believe 50% in the last two weeks. Gold is almost back to where it was when it went down a little bit two weeks ago when there was kind of a massive attack on gold. It’s right back to where it was. Jason Hartman: I would be a fan of gold if…And I’m a so-so guy on gold – I’m like, it’s okay, it’s better than fiat money, it’s better than paper – but it doesn’t produce income, it doesn’t have tax benefits. I think it’s a defensive strategy and it’s great like that, but when it comes to investing, I want an offensive strategy. Wayne Root: Listen, we all know I agree with you, Jason, that the value of gold is not to make you money. It’s simply to be defensive. Jason Hartman: It’s a savings account. Wayne Root: Correct. But having said that, let’s look at the results of gold that are just absolutely incredible. If you had a million dollars in the year 1913 – and I use that number because it gets people’s attention and it’s a round number – if you had a million dollars and you put it in the bank in cash or you put it in your mattress – doesn’t matter where you put it, it’s cash – it’s worth $40,000 today. Yeah, a million is worth $40,000 today. So it’s down 96%. But if you took that million and invest in gold in 1913, do you have any idea what that’s worth today? Jason Hartman: Maybe it’s worth about the same, I don’t know. Jason Hartman: Wow, but see here’s the problem. Gold wasn’t really a free market for a lot of that time because of Bretton Woods and the way the government bought it back. You could definitely make that argument from 1971. Wayne Root: That’s what I was about to do. So I was about to say let’s try some different years. In 1971, if you put a million dollars into cash, today it’s worth $200,000. The same gold would be worth $47 million. In the year 2000, if you put a million dollars in cash and held it until now, you’ve got $663,000. If you had it in gold, you have $5.7 million. So it seems like no matter what the timeframe is, you do more than defend and protect with gold. I think what the real answer is, Jason, is probably some would argue gold doesn’t even go up even with those statistics. All it does is hold it down. Jason Hartman: Most will say it holds. The famous old saying is 2000 years ago you could buy a toga and a pair of sandals – today you can buy a suit and a pair of shoes. Wayne Root: The gold holds while everything else loses all its value. So you’re better off in gold. That’s all I could say. So we all agreed on that, myself and all the millionaires and billionaires. They taught me a few other things. We both agreed that you have to move to a no tax state. Obviously I knew that because I moved from California and New York to Nevada, so I paid 0 state income tax. Jason Hartman: Right. And I agree with that. Listeners, if you’re concerned about the way things are going, the first thing that you can do that’s relatively easy is you’ve got to get out of these big government states. I mean, two years ago I move from California to Arizona. Admittedly, Arizona’s not a no tag state. But it’s pretty good and it’s pretty business friendly and there are other reasons I picked Arizona of course. But I agree with you. If you can just get out of an oppressive state, you can accumulate wealth so much more quickly. I mean, my successful friends in California are now facing 13.3%. That is unbelievable. Wayne Root: And I think about double the property taxes that I pay in Nevada and massive sales tax. Jason Hartman: And the cost of living is so much higher. Wayne Root: Correct. And I agree with your decision, by the way. Arizona’s a very good state. Jason Hartman: No, I love Arizona. Wayne Root: It’s not the best, but it’s pretty darn good. I’ll tell you what. When I name states that aren’t no tax states that are pretty low tax and low regulation good states to live in, I always say Utah and Arizona and Georgia are three that come to mind easily. Jason Hartman: It’s not just the tax. It’s the cost of living as a whole. I mean, you can live so much better in so many other states than you can in California or New York. I mean, just get out of those places. Any of these places with big liberal government, everything becomes expensive. They won’t let anybody build, so the land is massively expensive. They’ve got 1000 regulations on everything. So going out to dinner is twice the price. Everything is more expensive in those places. Wayne Root: And listen, these guys pointed out to me, these millionaires and billionaires, in my new book The Ultimate Obama Survival Guide, they pointed out that over a 40 year career in business between your 20s and your 60s, at the end of 40 years, if you’re middle class, you’ll probably have an extra quarter million or half million just for living in a no tax state versus a high tax state. If you’re upper middle class, you might easily have another million, and if you’re rich you might have $2 to $5 million on the day you retire. Does anybody not want an extra million or two on the day you retire? Does anyone not want to leave your kids an extra million or two? Jason Hartman: It makes a big difference, no question. So get out of expensive states. That’s the first thing to do. Wayne Root: Jason, there’s a few other things. They said that you should invest in energy stocks because most of these rich guys believe that oil is going up because of Obama’s policies. He won’t let you drill, he’s trying to destroy the coal business, he won’t let you frack, he doesn’t want any nuclear plants to be built. So our country, instead of being energy self-sufficient, winds up depending on oil from other countries who keep raising the price. They think because of that gas will go up, the price of a barrel of oil will go up, oil will be more valuable because there’s less of it. And so therefore they believe that you should own energy stocks. They believe you should own farmland and agriculture stocks because the price of food will go up. They believe you should own medical and medical real estate because Obamacare means that the government will spend more and more money on medical. And last but not least of the little short tutorial I’m giving you here – the details are in my 450 page meticulously researched book – but the last little one is invest in foreign stocks and bonds and real estate, because we used to believe America was the greatest country in the world. And maybe it’s not. Maybe you really have to understand that from now on other countries will grow faster because we have Obama suppressing our economy and demonizing capitalism and suppressing our growth. So countries like China and India, they named quite a few good ones: Switzerland, Brazil, Chile. They named Thailand, Laos, Cambodia, Australia, New Zealand. These are all countries that have younger demographics, hungrier people who don’t depend on government and governments that actually make it easier to do business than America does now. So they believe those are the places that you should invest with. Jason Hartman: Yeah, very interesting. And I definitely considered all of those things, especially the foreign stuff. And it’s just odd to me. I’ve got a friend who moved to China and he loves it. He’s very anti big government and so forth. And you look at these other countries and all those people want to come here. It’s a little bit hard to reconcile. Wayne Root: Let me tell you something about the masses, Jason. The masses are very slow to catch up to any trend and that’s why they’re always the last one in and that’s why they always lose their life savings. They’re always buying stocks at the time when the market’s about the crash, they’re not in the market whenever it booms. They’re about to buy gold when the market is about to crash in gold. And the minute it crashes like two weeks ago, they’re all getting out of gold and going into the stock market which is at all-time highs. This is the moment you should be in gold and of course they miss out on a 50% hike in the last couple weeks. So, they’re always making the wrong decisions – same thing around the world. So the people coming to America now or desire to come to America, they just don’t realize that with Obama in charge it isn’t the same America and they don’t have the same opportunity to make money. They’re living on old knowledge from the history books in their school from 50 years ago that this is the greatest country and the greatest economy. It’s old news they’re operating on and it’s incorrect. It’s flawed reasoning. Jason Hartman: Yeah. Have you considered moving out of the country? Wayne Root: You know, I would if I didn’t have a 5 year old daughter and an 8 year old son and if I didn’t have a political career where I think I’m gonna be the guy hopefully leading the fight against Obama. I mean, I’m here for good because my life is politics and leading the fight. But if I had no ties, if I wasn’t in politics and if I didn’t own businesses all over Nevada and if I didn’t have little young children, I would absolutely certainly be getting a dual citizenship somewhere. If not moving, I’d get a passport from another country like Dominican Republic or Panama or many other choices out there that I list in my book. A lot of my friends are doing it. I must tell you, I would say 50% of my friends are doing it. Jason Hartman: Yeah, some of my friends are doing it, too. And I gotta tell you, that second passport thing is tough. It’s not easy to do. It’s expensive and it takes time. And it’s very complex. I mean, every country has such different rules. It’s a very complex thing, no question about it. But very interesting, Wayne, very interesting talking to you about this. The question that just begs to be asked here, since all this discussion has really centered around Obama and your book is centered around Obama is, look, how much worse can it get in the next 3 and a half years? I mean, it’s not like Obama is gonna be forever. Wayne Root: It can get a lot worse. Here’s what I would say. I think one of the brightest men in the world, tied for one of the 5 brightest men in the world is Bill Gross. Do you know that name? Jason Hartman: Sure, yep, Pimco. Wayne Root: Pimco, exactly. Smart man, Jason. Pimco is the world’s biggest bond fund and it’s run by Bill Gross. You don’t get any smarter than that. I don’t know what the numbers are under management, but it’s in the mega tens of billions. Jason Hartman: And Bill Gross, by the way, lives in my old town, Newport Beach. Wayne Root: Ah, very good. Yes, he’s an Orange County man. So, I mean that’s as smart as anyone gets. And Bill Gross had a comment – he had a tweet over last weekend. And you know what his tweet said? It said exactly what my opinion is. And I’m just a small businessman but I’m very proud that I think like very rich smart guys. His tweet said there’s really only 2 futures for America, one a slow growth like Japan – meaning 2 lost decades Japan has had where the economy is just dead in the water – and the second choice he said is unimaginable: total economic collapse. Those are what we’re limited to at this point. Jason Hartman: Let me just address, if I may, the Japan thing for a moment. I mean, I’ve studied Japan extensively and of course I’ve been there. Japan’s problem, a big part of their problem, is that they’re just not having any children. They’re a close insular society. They don’t have immigration and they don’t have kids and that’s why they’re dying. And that’s very different from America. Wayne Root: But they also have tremendous debt and they do share that with America. And that’s the same problem Greece has, the same problem you find throughout Europe. The problem is debt destroys economies. In history, it always destroys you. In the end, you can quote me on this, I believe this is correct that in the history of the world no country that’s ever passed the threshold of 100% debt to GDP ratio has ever recovered. And the United States is now passed that ratio. Japan is at 220%. So Japan is gone. They have no chance to ever recover and in America it’s doubtful whether we’re going to make it. But at least there’s a chance. Maybe we’ll be the first one ever recover if you can stop the debt now. But you say 3 more years, what’s Obama gonna do to the debt in another 3 years? Jason Hartman: He’s gonna add another 5 trillion to it. Wayne Root: Exactly. I was gonna say 4 to 6 trillion, exactly. So, I think it gets worse. I think the picture is very scary. And I think if you assume the world is awash in debt, which it is, the whole world is a big in search of a windshield, which it is, then you gotta buy gold, Jason, because gold is the only protection against massive hyperinflation and I think that’s what you have to have. What’s that famous saying I talk about in every media interview? Everybody likes to say this time is different. Well, throughout history, this time is never different. Jason Hartman: I read that book by the way. There’s a book by that title. Wayne Root: It’s never different. And throughout history, if you print a lot of money, you get inflation. Just nobody knows if it’s tomorrow, 5 years from now or 10 years from now. We’ve been printing a lot of money for 5 years now, just record setting amounts of money since 2007. And the only question is when is the hyperinflation or stag inflation gonna hit? When it does, gold will go to 5 or 10 thousand. Forget about where it is now. $1450 is peanuts change where it’s gonna be eventually when hyperinflation hits. So that’s why I think the answer is you gotta know where to buy gold, how to buy gold, and where to store gold in case Obama decides to confiscate it like FDR – and that’s his hero, by the way. So my book, The Ultimate Obama Survival Guide, answers all of that. You gotta know where to buy it, how to buy it, where to store it. And that, in the end, is more important than actually the price of gold. Jason Hartman: Wayne, do you have a moment for me to just ask you on a devil’s advocate thing here? Jason Hartman: Listen, I have studied this and I agree with what you’re saying as far as the math goes. But let me just propose a different idea to you. And I’m not a gold bug really at all. And I do own gold and I own silver and I own platinum and palladium and I understand metals extremely well. So, we don’t need to debate that. I like income property much better because in an inflationary environment, the debt, the mortgage on that property which is a 30 year fixed rate mortgage, gets completely debased or “paid off” by inflation. And that is the ultimate inflation protection is to be in debt. And I know it’s counterintuitive for a lot of people. You really gotta get your head around it. Wayne Root: No, I basically agree that in times of great inflation, one of the things you want other than gold is you want to own property because it’s gonna go up. I basically agree with that. The only thing I’m worried about is if you have a total collapse of the economy, there’s nobody left to rent the apartments in your building or rent the offices in your building. There’s no one to sell your building to because obviously there’s not a people left who can buy a building. Money is scarce. Jason Hartman: The building or the rent of the house, the house itself is not a fixed idea. See, everybody’s gotta take their mind off of that. It’s just that they will rent a lesser house. Instead of living in a mansion, they’ll live in a shack. But there will be a renter on their way down the economic ladder to rent something. And there will be a government bailout program from some scumbag politician like Obama who wants to pander and do section 8 housing and give people a free house just like a free Obama phone. Wayne Root: So tell me the question. Jason Hartman: So, here’s the question. Look, I think the demise of America has been largely overplayed by people because they’re looking at the same things you’re looking at. They’re looking at the math. And if you look at the math and the numbers, you couldn’t be more correct. But here’s the thing you also need to look at. You need to look at the fact that for the time being, America does have the world’s reserve currency and I agree that there’s a lot of noise out there about that. There’s a lot of people, a lot of other countries that want to get away from that, but then we have the world’s largest military to keep it that way. We are by far the wealthiest country on earth. We have the largest GDP by far. We have a brand that, granted, I agree that America’s in decline, I couldn’t agree with you more, but the concept of this collapse, I mean nobody can afford to have America collapse. And America’s not gonna give up the bully pulpit of the world’s reserve currency because that is too valuable. Wayne Root: Just because no one can afford American collapse doesn’t mean it won’t. I mean, no one could afford the banks to collapse in 2008, no one could afford Bear Stearns to collapse, no one could afford Lehman Brothers to collapse, and almost every other bank and stock firm on Wall Street collapsed too. They all were going under and, because we couldn’t afford it, we bailed them out. But there’s no one to bail out America because, as you pointed out, the rest of the world doesn’t have our money. Jason Hartman: I’ll tell you who bails out America, Ben Bernanke. It’s the frog analogy. It’s just more and more inflation. And so that’s what they’re going to do. They’re going to just inflate their way out of the mess. And so you should own some metals, you should own some income property. Because just back to that income property question, you own commodities. You said yourself that stuff goes up in value because it’s a commodity. It’s just like gold and silver. All you’re buying is lumber, petroleum products, copper wire, glass, steel, energy. That’s all in a house or an apartment complex. And then you finance it with this 30 year fixed rate debt. I mean, if someone gets a mortgage today, they’re not gonna make the last payment until 2043. Can you imagine how much inflation is gonna happen before then? I say right now, of course the CPI and the inflation figures are massively understated – right now I believe we have 9 to 10 percent inflation right now. Wayne Root: I exactly agree. Jason Hartman: I think you’ll agree with me there. So right now if you have $1 million in mortgages, the government and the federal reserve – Ben Bernanke and Obama – by their stupid mismanagement and massive spending are essentially paying off $90 to $100 thousand dollars of your million dollar mortgage every year. I have a name for this. Wayne Root: The only area we diverge is just I believe that if you own enough gold and silver right now, 5 years from now it’ll go up so much that you can buy up the locks of real estate all over The United States at discount prices and then become the real estate king. I think you’re a little early to real estate. I think you can make even more money by buying it up once it goes down again. I don’t think we’ve seen the bottom. I think there’s gonna be one more drop. Jason Hartman: Listen, I don’t disagree with you. Wayne Root: We’re generally in the exact same place. In the end, you’re not gonna lose your real estate again. Jason Hartman: I think in markets like California, overpriced markets with high land values, we are going to see more drops as we have these economic collapse events occurring along the way. But all I’m saying is that the goal is speculative. You don’t know for sure, neither do I. You got Harry Dent out there saying gold’s gonna go to $750 an ounce, it’s gonna be cut in half. He may well be wrong. He’s been wrong many times before but he’s been right about a lot of things, too. None of us know. It’s just speculative. At least with the income property, you got cash flow today and tax benefits today. So, I just wanted to throw out a new idea. Wayne Root: We all know what Obama’s doing to The United States. Wayne Root: Yeah, but they’re not. They’re not, don’t you see that? They’re not. And as far as all the things we’ve got, Jason, again, I’ve been the world’s biggest American patriot you’ve ever met my whole life. But all my friends who are ultra-rich are all leaving. They don’t even want to be here anymore. Jason Hartman: I think it’s just a massive overreaction. That’s all I’m saying. Wayne Root: The question comes: when the rich leave, who’s gonna pay the taxes? Who’s gonna pay the bills? That’s the question. Can we turn it around if Obama wrecks things even worse in the next 4 years. And I think it’s clear he will wreck it worse, but the question is will he wreck it so bad it’s beyond repair. That’s what we’re all hoping doesn’t happen. Jason Hartman: Very good point. And there’s a book about that, Atlas Shrugged. I’m sure you’ve read it. Jason Hartman: The producers are going on strike, there’s no question about it. There is a movement afoot that way, but they’ll just print more money and it’s sickening and it’s disgusting, but it’s the way of the world. And we’re just gonna have inflation. Wayne Root: And take advantage of it, that’s all. That’s why I wrote The Ultimate Obama Survival Guide. We were gonna do a half hour interview. Did you know it’s gone an hour? Did you know that? Jason Hartman: No, I didn’t know that, but you’re so darn interesting. Wayne, give out your website. Tell people where they can learn more about you. Wayne Root: Sure. The book is The Ultimate Obama Survival Guide. Of course you can get it at Amazon. It’s the number 1 finance book at Amazon. It’s the number 1 conservative or liberal book at Amazon and all week it’s been a number 1 or 2 economics book at Amazon. So I’m very proud of that fact. Or you could buy it at any good bookstore, Costco or Sam’s Club or Barnes & Noble, etcetera, Books-A-Million, or you can go to my website which is RootForAmerica.com to find out more. Despite my pessimism, I am rooting for America. I always have and I always will. Jason Hartman: Hey, I gotta ask you. 2016, are you looking at a presidential bid? Wayne Root: I think what I’m looking at realistically is a Senate bid. I think it’s a lot smarter to first prove that you can be a governor or senator for a couple years before you run for president. I think Obama already proved we don’t want inexperienced people running for office. So, I think United States Senate in Nevada in 2016 is a nice spot for me as a republican, and that’s what I’m aiming for as we speak right now. Jason Hartman: Fantastic. Well, Wayne Allyn Root, thank you so much for joining us today. The website, again, is RootForAmerica.com. And keep getting the word out and keep up the good work. We’d love to have you back if you have another book or any new news you want to share. Wayne Root: You got it. Thank you very much. The Ultimate Obama Survival Guide, because let me tell you something. You want to do more than survive. You want to survive and prosper and that’s what I’m trying to help you do. Thanks.